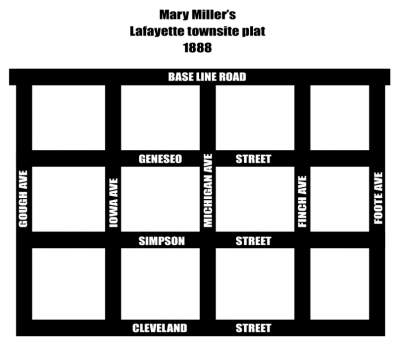 Mary Miller’s 1888 town of Lafayette plat featured 8 streets laid out on 37 acres. When town founder Mary Miller attached street names to her newly-created Town of Lafayette, she did so in pairs and in an anti-alcohol state of mind. Her initial 37-acre, 1888 platting of the town featured eight streets that were named for family relations and temperance allies John B. Foote and John H. Simpson; famous temperance movement leaders John B. Gough and John B. Finch; cities she was fond of including Geneseo, N.Y. and Cleveland, Ohio; plus two states, Iowa and Michigan. Mary Miller’s disdain for alcohol was so strong that she included deed restrictions in her platted lots forbidding anyone from selling or giving away wine, beer or heavy liquor. Residents could drink alcoholic beverages, they just couldn’t sell them or give them away. The common narrative passed down through the generations is that Mary Miller named Cleveland Street in 1888 after Pres. Grover Cleveland, a Democrat elected in 1885 as the nation’s 22nd president. But imagine Mary Miller trying to explain to her teetotaller friends that the term “Bourbon Democrat” didn’t have anything to do with Kentucky’s favorite elixir. Second, Grover Cleveland sided with the Democratic Party in its opposition to temperance. Given Mary Miller’s temperance beliefs, a plausible alternative is that Cleveland Street was named for Cleveland, Ohio, where the Women’s Christian Temperance Union, which Mary Miller was a member of, was founded in 1874. In 1889, Mary Miller amended her 1888 town plat and added four more streets named after U.S. Presidents Benjamin Harrison and Chester Arthur and family relations Emma Rabb and George B. Cannon. Gough Avenue – (a person) named for national temperance leader John B. Gough. Finch Avenue – (a person) named for Prohibition National Committee chairman and Good Templar organizer John B. Finch (1852-1887). Foote Avenue – (family relation) named after Mary Miller’s father, John B. Foote. Simpson Street – (family relation) named for John H. Simpson, a temperance ally of Mary Miller’s, who sank the Spencer-Simpson mine 1887 to 1889. Iowa Avenue – (the state) where Lafayette & Mary Miller were married. Geneseo Street – (city) where Mary Miller was born, Geneseo, N.Y.
Harrison Avenue – (a person) named after Republican President Benjamin Harrison, a supporter of the temperance movement. Chester Street – (a person) named after Republican President Chester A. Arthur. Cannon Street – (family relation) named for George B. Cannon (and possibly Grace Cannon), a temperance ally of Mary Miller’s. Emma Street – (family relation) Mary Miller’s favorite niece, Emma McClane Rabb. Roosevelt – Mary Miller’s favorite president, Republican Teddy Roosevelt. Kimbark Street – named after Mary Miller’s sister, Laura “Nellie” Kimbark. Dounce Street – named by James Cannon Jr. for Elmira, N.Y. native William J. Dounce. Brooks Avenue – named by James Cannon Jr. for Henry C. Brooks, an executive with United Coal. Hopkins – named by James Hopkins and O.M. Hopkins. 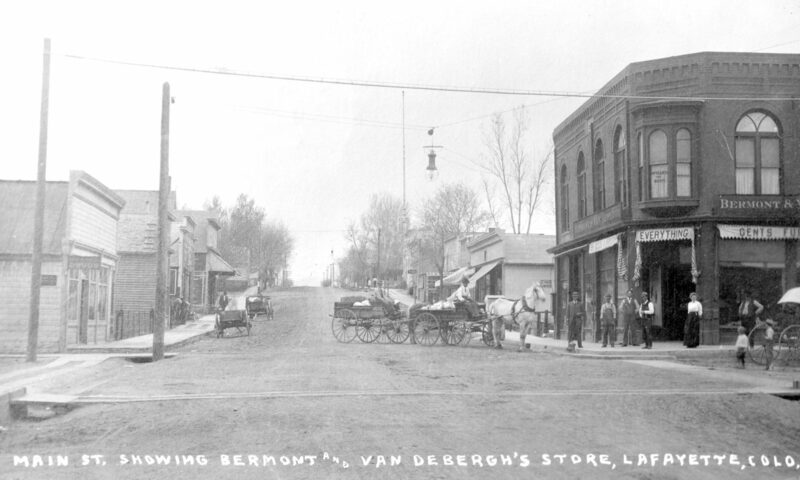 Bermont Avenue – named after mercantile owner George E. Bermont.